Liberal... Conservative... Moderate... or something in between? For too long, we've applied arbitrary, imprecise labels on people to describe their political inclination. In just a few minutes, the Political Inclination Quotient (or PIQ Score) test gives you an exact rating, in 10 important criteria, of where you stand in the American political spectrum. It's kind of like a GPA or a FICO® score of your Political Inclination, except that it doesn't matter if your score is low or high: your personal preferences are the key. Just like how spicy you like your food on a 1-to-10 scale, or how firm you like your mattress on a 1-to-100 Sleep Number® scale. Ever wanted to know precisely where you rank politically compared to others? Finally, you can. Americans are a diverse lot. When you calculate the dozens of issues we use as criteria for electing our leaders - like abortion, guns, taxes, immigration, energy, and the environment - Americans have more than 150,000 possible combinations of "Political Inclination." And yet, we have only three labels to choose from, when it comes to describing our political orientation: "conservative," "liberal," or "moderate." But what if you are conservative on some issues - like gun control, immigration, and prayer in public schools - and liberal on others... like abortion, the environment, and legalizing marijuana? What do you call yourself then? And what if some issues - like taxes, government spending, and job creation - are way more important to you than social issues likes gay marriage, immigration, and voting reform? PIQscore.com is the first scoring mechanism for aggregating Americans' diverse opinions into a single, actionable raking... called the "Political Inclination Quotient" or PIQ Score. PIQ Score gives you an "average of averages" to help you see precisely- on a range of zero to 100 - where you stand in the American political mix. Whether you are wildly or mildly Liberal (PIQ-0 to PIQ-49), or if your conservative orientation is somewhere between "lean" and "extreme" (PIQ 51 to PIQ-100), only PIQ Score gives you a precise mile marker for where you stand in the American political spectrum. Of course, states have PIQ Scores, as well. We've modernized the old "Blue State, Red State, Purple State" cliché by tabulating actual Federal Election Commission results for the past 30+ years to give an detailed moving picture of your state's historical political orientation... searchable alphabetically, by state PIQ Score, and by Electoral Vote count (below). So you learn a lot about yourself, your state, and the issues of the day, with no hidden agendas. No stealth lobbying. No sock puppets. Just vigorous, civil discussion among friends who haven't met yet. 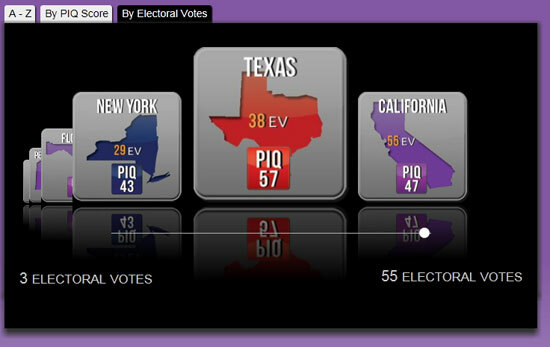 We think PIQ Score is going to revolutionize the way Americans evaluate, discuss, decide, and report on political issues. You'll think it's one of the coolest ways ever to learn more about what makes your friends, family members, classmates, and co-workers tick. 51 years old and life as I have known it is over. Wow! Only a PIQ of 91! Job creation and taking money that isn’t yours.